Pokkiri Simon is not just a movie, which narrates the story of a group of ardent Vijay fans, but literally fills in all the notable elements which you would come across a typical Vijay movie. Well, the only difference to quote here is that not many areas appear as fresh as that of the glitziness of a Vijay mass masala movie. Pokkiri Simon (Sunny Wayne), Hanuman Biju (Jacob Gregory) and Ganesh (Appani Sharath) belongs to the group of die hard Vijay fans, who cares nothing but only about Ilayathalapathy. Obviously their parents are much worried about the future of them, but who cares? With Prof. Seetharaman (Nedumudi Venu) helming their fans association, they might not be bothered much about pleasing old generation. Meanwhile, Simon met a young girl Deepa (Prayaga Martin) and fell instantly in love with her; the reason, Deepa is an ardent Vijay fan! 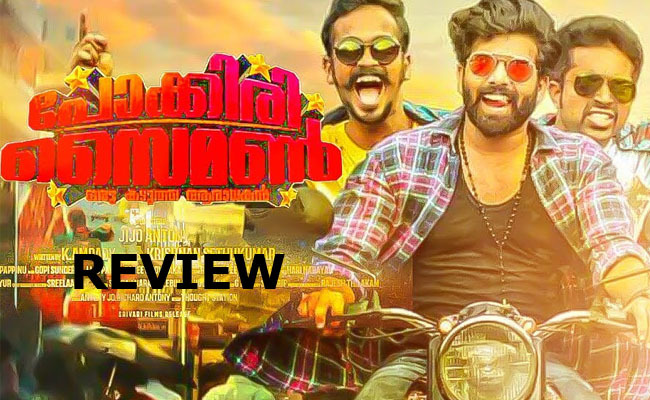 It is Simon’s journey to fulfill his dreams which comprises ‘Pokkiri Simon’. How he became a real ‘Pokkiri’ is what you would see up next. See, obviously you won’t expect much of a rocket science kind story right here in this movie of fans. In an attempt of paying tribute to Vijay, director Jijo Antony has even copied down the elements, which constitute a typical Vijay movie. However, in an attempt of juggling between various aspects, ‘Pokkiri Simon’ literally nothing in its belly, by the time it crossed the finishing line. Yes, you have actions, romance and colourful dance numbers, but doesn’t carry a likable storyline. Well, the makers also failed to execute a mass hero out from Sunny Wayne, who was virtually transforming to another reminiscent of Vijay’s larger than life characters. Eventhough the makers have tried to bring some socially relevant issues – to name a whole lot of items – which all failed to evoke the desired result. Had if they tried to make a genuine attempt to wield the attention in making a gripping storyline before proceeding to the filmmaking process, they could have come up with a better product. We can’t say much about the acting department, with none of them having any great scope to exhibit their acting prowess. While nothing in particular looked great about the film, the cinematographic department helmed by Pappinu looked good enough in bringing many colourful frames.